Nowadays, the polluting car is increasingly being banned from city centers. To offer an alternative for moving quickly and comfortably, there is this KidsCab Velotaxi or taxibike. The KidsCab Taxibike is an alternative, non-polluting and easy personalized to transport people or goods by bicycle in the city in an ecological way. 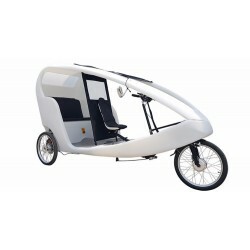 This taxi bike is suitable for both professional and private use. Moreover, it can be completely personalized with stickers.